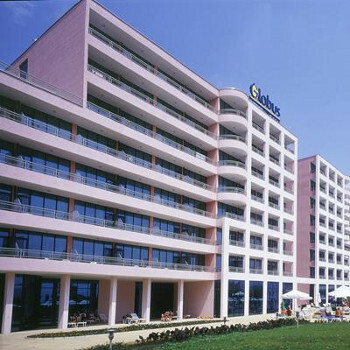 The undisputed symbol of Sunny Beach - the hotel Globus, will astonish its loyal guests and new visitors with a brand new look. Renowned for its hospitality and service, fully renovated for Summer 2003, this modern, creatively designed complex is surround. My second vist to this hotel. Once again I requested and was given a room with a pool view, behind which was the bay streching from cape Ermin to Nessebar. I was on the thirteenth floor and had a splendid sea view. My room was a twin for sole use. It was clean and well appointed and I could find little to complain about at all. The screen door onto the balcony would not latch shut but the mozzies haven't woken up in May and the room had working air con any way. Only had breakfast in the resturant but there was plenty of choice and the tables were cleared and quickly available for the next guests. You can't beat the Globus for location, right in the resort centre and only the promanade separating it from the beach. The staff handled all my enquires efficiently. Even retrieving the young scandiavian drunk from the stair-case and depositing him back in his room promptly. I am not a fan of pub quizes or Bingo so the entertainment in the hotel did not appeal to me but these sesssions were well subscribed so it's probably just me. I have made comments about this hotel in the past complaining that surrounding bars were very noisey in the early hours. I rolled in most mornings at 3am to complete silence so maybe someone has had a word? A brilliant hotel I can't wait to stay there again. Hotel Globus was a very clean well run hotel. Having read some reports on this site I was resolved to eat out despite having a half board booking. I tried the restaurant the first evening and was very impressed with the food and service.I enjoyed 12 meals in the restaurant and all were excellent.The reports of poor food and scruffy incompetant staff do not reflect accuratly this restaurant in 2010. The room was clean and well eqipped. I was given a room with a front sea view which was splendid. I only had two negative things to say about the hotel. During my stay two candy bars dissappeared from the mini bar. I complained and was not charged for these so fair enoughski. The real issue though is the noise at night from the local bars and discos. I feel this may be a real problem for the early to bed brigade. I didn't get in much before three most mornings so not a problem for me. Three o'clock is when the noise goes down to a dull roar. We stayed at this hotel two years ago and the big disapointment then was the awful food - this time the food was even worse! Apparently, talking to other English holiday makers in the resort, food in all the hotels are terrible. I only gave a rating of 1 because at least there was some cereals available at breakfast! This time the staff appear less friendly than before, particularly in the dining rooms who appear to rigidly enforce the rule that food cannot be taken out of the restaurant (given my comments above I think the sign should state that food cannot be taken IN to the restaurant), but we saw Russian and Bulgarian guests walk out unoppossed. The hotel Globus is in a good position near the beach,however if you had a sea view you were kept awake untill 5.30am ish by the Tropicana whose speakers were on the outside of the pub and played loud rap type music all night. We changed rooms to the back but then had to listen to building work all day. The rooms were cleaned daily and clean towels were delivered each day. The hotel itself is bright and modern and kept very clean. The location is ideal for the infirm since it is on the flat and has no steps. The rooms we occupied were kept clean but the shower in one of them leaked badly. The staff at reception are most unfriendly and make no effort to be at all helpful. The safe deposit box is expensive and non refundable. The outdoor pool looks clean but I got a severe ear infection from swimming in it. The sunbeds are mostly broken so only the early birds will get good ones. The bar staff were generally friendly and the service good. The food is extremely poor though and has to be seen to be believed. If you happen to be a vegetarian then you will have to eat out all the time unless you can surive on lettuce, olives, tomatoes and cucumber. The hotel provides no evening entertainment other than Bingo on Monday and Thursday evenings. This is supposed to be a 4*+ hotel but the food was really not very good. Breakfast was very poor with absolutely no choice eggs, eggs or eggs or a very suspect sausage. Evening meal had a bit more variety but was not always palatable. Maid service was very good but again the toilets in the public areas were not kept in the cleanest condition, but i suppose you could blame the public for that. There was some entertainment at the A La Carte area a couple of guys on guitar and keyboard , very good. Super room, large, bathroom & separate w.c/basin, large bed, bedding changed daily, good view overlooking sea, was on 3rd floor, even better views floors 4-8.very clean throughout hotel. Nice large pool but meny broken tiles, also allow you to take glass on poolside ! If you're a poor sleeper be warned, loud thumping music from outside bar area going 24/7, we got used to it after approx 3 days but many people didnt. Reception staff quite unfriendly as were waiters in dining room, waitresses better. Bar staff fine. FOOD IS APPALLING. Barely 2 star being kind. Breakfast particularly gruesome. Soup always good in evening, main courses repetetive & unappetising(and i'm not a fussy eater). Wife, kids & inlaws struggled. Overall, decent hotel spoiled by food/noise.